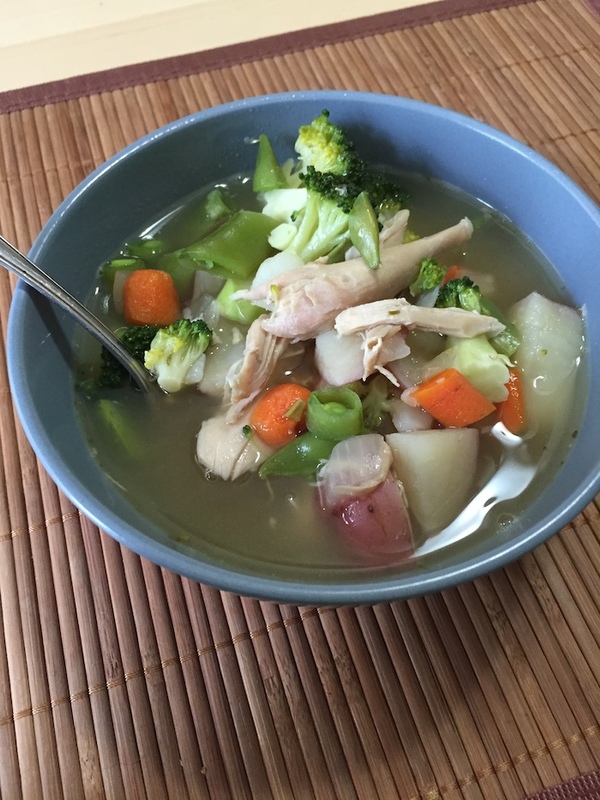 My boyfriend might call this Vegetable and Chicken Soup, as his only complaint was that there wasn’t enough chicken. However, I intentionally added lots of vegetables. Most Americans have no problem getting the protein that they need in their diets, but fruits and vegetables are usually lacking. So when it comes to soups I like to load up on the veggies, it’s an easy way to add a bunch of different flavors and textures. That said, if you think you need more protein, add more chicken, or add a can of your favorite beans (rinsed) when you add in the stock. This soup came together easily. After eating most of the white meat off of a whole rotisserie chicken I’d gotten at the Amish market, I saved the rest for this soup. If you don’t feel like making the stock from scratch, feel free to use premade chicken stock. Although it’s amazing how easily this soup came together from what I already had available to me. Just use this recipe as a guide and substitute in whatever vegetables you have in the fridge. It’s great for clearing out the last little bits of this and that that you don’t have a plan for. I also love that nothing goes to waste, so keep this simple stock idea in mind with your upcoming turkey feast. For the stock, place the chicken bones in a large pot and cover with water. Add bay leaves and salt and bring to a boil. Let simmer for about 30 minutes. Taste broth before using to adjust seasoning as needed. For the soup, heat olive oil over medium high heat and sauté the onions. As the onions are beginning to soften, add the carrots and potatoes. Sauté the vegetables until just beginning to brown. Add the stock to your soup pot. Add bay leaves, oregano, and chicken. Let simmer for about 15 minutes, or until the potatoes are soft. Add the snap peas and broccoli and simmer for another 10 minutes, or until the broccoli is cooked to your liking. Taste and season with salt and pepper as needed. I am honored to be mentioned in the opening of this entry! The soup is quite delicious.